After applying the WHMCS 7.7 update, the Run Migration button may not appear on the Setup > Payments > Tax Configuration page > VAT Settings tab. If the button is not displayed, these conditions were not met. It may be desirable to migrate a custom field containing a tax ID into the new native field, even if the EU VAT Addon was not in use prior to updating. Replace x with the ID of the Tax custom field to be migrated. That's the tblcustomfields.id value. 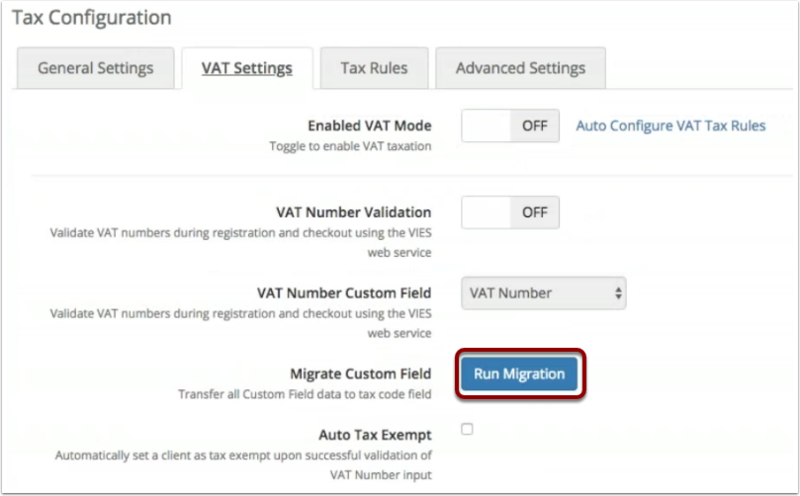 Reloading the Tax Configuration page should now display the Run Migration button on the VAT Settings tab. If it does not display, double check your entry of the Custom Field ID value. NOTE: This only works for Custom Client Fields. The migration cannot be performed for Product or Support Custom Field types.